Chilli is an all- time favorite dish that inspires the best in your creative cooking. Making chili from scratch is fun, what with all the options you have of fresh ingredients to suit your taste. 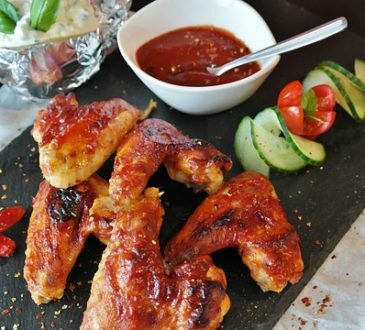 Your busy schedule, raging appetite, and sometimes the short time available do not grant you the luxury of time and to put together your varied combination of meat, beans, vegetables and spices. So you are looking for the healthiest canned chili you can find. I can say that canned chilis are the healthier alternative to fast food and substitute for when you want to eat natural, spicy and tasty goodness on the go. Combine it with rice, baked potatoes, pasta, tacos or bread, topped with onions and cheese, and you have a healthy, spicy, satisfying meal, with or without the meat. A great comfort food, you can also tantalize your taste buds by using chili as a dip for your nachos or corn chips. The best canned chilis are not only nutritious and tasty. They have a long shelf life, so you do not have to worry about spoilage, and you can stock up on a reliable alternative for your ready tasty meal or snack. There are numerous options of canned chili on the supermarket shelves, all promising a spicy, flavored experience. Of course, this doesn’t make the selection any easier, but I am here to help make your canned chili selection and dining experience, a blissful walk in the park. How Can You Be Certain You Are Buying The Healthiest Canned Chili? You are in the supermarket in search of the best chili that will give you spoonfuls of nutritiously spicy, tender meats and creamy beans and vegetables like onion, peppers, corn and tomatoes. Sometimes, they will have some bits of soya or tofu. But there are endless cans of canned chili….! Whatever your preference, let us be certain that you are buying the best canned chili. The most important ingredient in your chili is meat, beans and tomatoes. Without the beans, well, this will be just a meat sauce. The right blend of these three make for the best canned chili. If your preference is vegetarian chili, the right combination of beans, tomatoes and other vegetables determine the quality of your canned chili. Yes, chili wouldn’t give you that desired punch without the tangy, hot chili peppers! The spice level of the chili are determined by the kinds of peppers used. 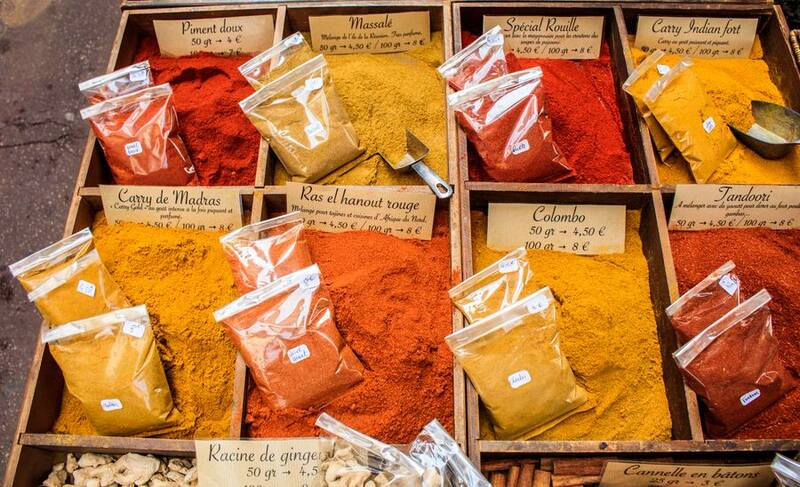 Your personal preference should guide your choice of spice level, but you are not limited. Whether your choice is mild and flavorful, medium or hot to set your mouth on fire, the best canned chili should give you that nice smoky flavor from the blend of fresh tomatoes with hot peppers. Sometimes, the flavor may not quite meet your match. You can always spice up your chili with cumin, garlic, pepper, chili or oregano. The best canned chili is not too thick, runny or watery, like a tomato soup. Rather, it has an ideal thickness that is more like a rich, thick sauce that can partner well with nachos and hot dogs, and be filling enough on its own. If you turn to the back of the can, you should see precise information on the nutritional value of the canned chili. The best canned chili will provide you with Vitamins A, Vitamin C, Magnesium, and Calcium, not forgetting Protein. The combinations of meat, beans and assorted vegetables will also provide you with much needed dietary fiber and iron. 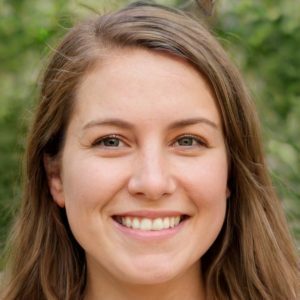 The best canned chili is mindful of your health- it has low sodium content, well within the recommended levels, making this a healthier option even for those without hypertension. Considering canned chili is a healthy option with a long shelf life, it should be in BPA free packaging, which is also airtight to preserve its freshness. Look out for BPA- Free labelled canned chili. You will see plenty of chili options and information provided on the can that can be quite confusing. Don’t let this overwhelm you. 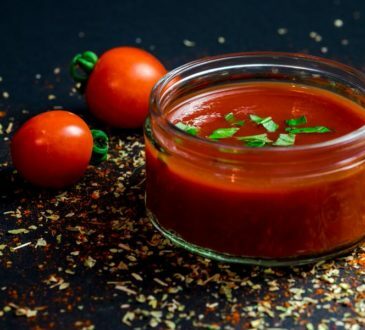 Go for your preferred choice of ingredients, whether meaty or vegetarian, spices, and consider the nutritional benefits and packaging safety, to ensure you are buying the best canned chili. I’ll go the extra mile and share some safety tips to keep in mind about your canned chili. 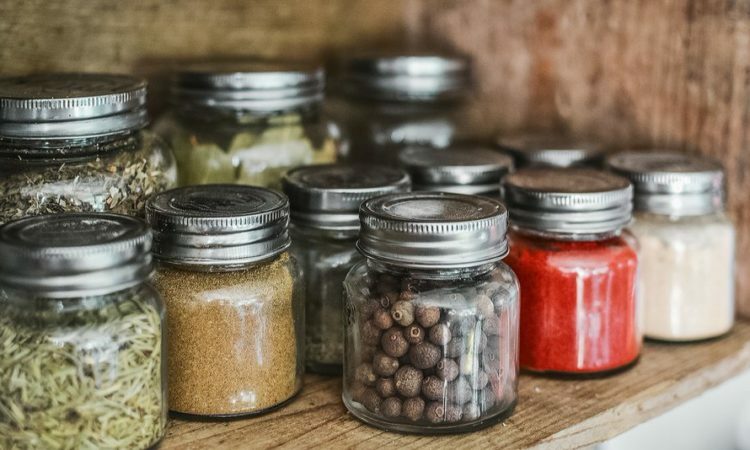 If you will not consume all the chili once you open a can, remove the leftovers from the can and refrigerate in an airtight glass or plastic container. This stored chili stays good for about 3 to 4 days in the refrigerator. Canned chili stored in airtight freezer bags or containers can extend the life and maintain the quality for about 4-6 months. It will also still be good to eat and use beyond that period, if kept in a constant 0°F freezer. Worried about the “Best By”, “Consume By”, “Best If Used By” or “Best Before” labels? Your canned chili is safe to use or eat beyond the expiration date indicated on the label or package, as long as the can is stored in the proper recommended conditions, is undamaged with no noticeable signs of spoilage. The date labels in commercial chilies are not safety dates, rather, they are the manufacturers’ estimate of how long the product will stay with the maximum quality still intact. If you defrost or thaw your canned chili in a refrigerator, you can store and consume it within 3 to 4 days. However, if you thawed it in the microwave or in water, you will need to consume it right away. It is easy to tell if your canned chili is spoiled or has turned bad. Simply observe its smell and appearance. If there is a foul or off odor, a change in flavor or appearance and the presence of mold when you open the can, these are sign of spoilage. Trash the canned chili immediately. If the packaging of the canned chili is bulging, severely dented, rusty, or leaking, these too, should be discarded. Now that you are certain of what to look out for when buying canned chili, let us look at the best canned chili that is available for you in the market. Well known for their organically grown foods, the family owned Amy’s Organic Chili is free of chemicals and GMOs. All the natural goodness of their beans and vegetables is available in a variety of chili, so you are spoilt for choice. Amy’s Organic chili offers you a wide array of taste experiences. If you like your chili hot, you can get your kick from Spicy- organic red beans and tofu in a Mexican sauce that is spicy, with just a hint of sweetness for balance. If you’re looking for a big chili flavor without the big heat, Medium with organic red beans and tofu simmered in a thick and flavorful Mexican-style broth is your choice. For a classic, perfectly spiced chili, the Amy’s Organic Chili Medium with red beans has savory garden flavors of organic bell peppers, potatoes, carrots and corn. You can also savor the Medium with Black Beans, Mac Bowl with rice pasta and tomatoes, among others. You are literally spoilt for choice. 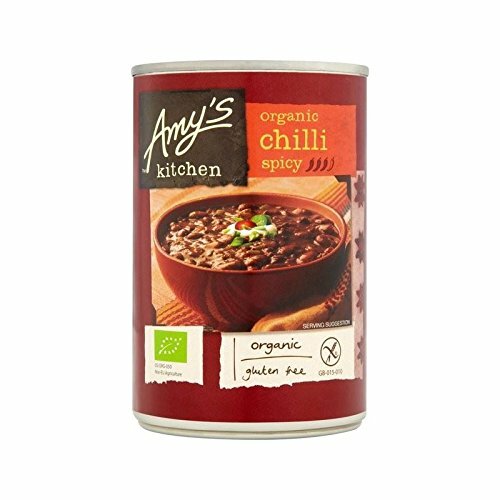 Amy’s Organic Chili is a great source of dietary fiber and protein, with no trans-fats. The nutritional contents contain 20% Vitamin A, 6% Calcium, 25% Vitamin C, and 20% iron per serving. It also contains an acceptable level of 28% of sodium. The chili contains the standard warning on food allergies for soy and nuts, though they do not use any peanuts, fish, eggs, or shell fish. Amy’s Organic canned chili is flavorful but not too spicy to offend your taste buds. The beans have a good firmness, with a delicious sauce. With all things Amy’s Organic being vegan, you are assured you will not have that not- so- palatable taste of canned meat products. The tofu in it is a great substitute for the meat lovers. Organic, non-GMO, natural ingredients. USDA certified organic. Sauce thickness is perfectly consistent. If you like it chunky and meaty, this canned chili is a good option. The meat portions are generous, and the sauce tastes great. Campbell’s Chunky Chili with Roadhouse is not too spicy, and this makes it the perfect choice if you prefer a mild- tasting chili. The mild yet complex flavor is complemented by vegetables that include corn, kidney beans and other vegetables. The big meat chunks make it filling, with a good bite and texture. The proportion of vegetables and meat is a good balance. Kidney beans give this chili a special taste. It can provide two large serving portions. Another of Campbell’s Chunky chili is the Hot and Spicy Beef and Bean Firehouse, which takes hot and spicy to another level. This blend comes teeming with kidney beans, chunks of cooked beef and pork, with red and green peppers that add spice in a thick sauce. It is a truly special accompaniment to cornbread or biscuit. The Hot and Spicy Beef and Bean Firehouse canned chili is easy to open as it features a pull- back tab, and you can eat it as is, or enhance the flavor for some more flavored heat. 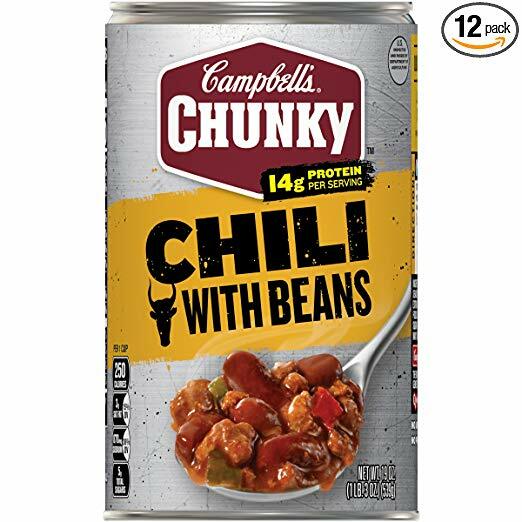 Nutritionally, Campbell’s Chunky chili contains 10% of Vitamin A, 6% of Calcium, 15% of Iron, and no Vitamin C. It also packs 870mg Sodium. One can provide two large serving portions. 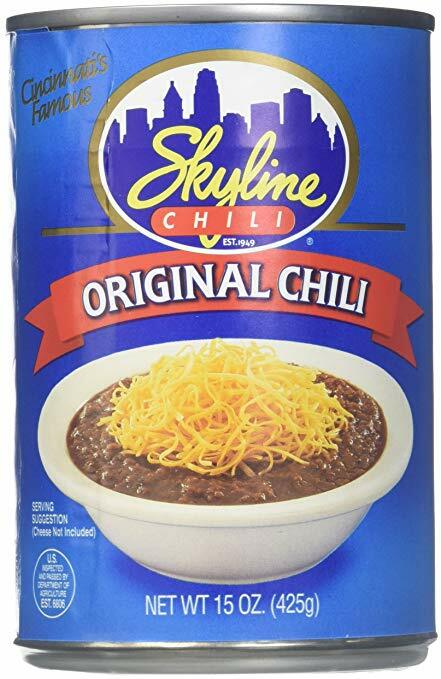 Skyline chili is quite different from other commercial chilies, as it is made with a unique blend of all things chili- cornstarch, yeast, paprika, tomato sauce, garlic, onion, salt, beef, and more spices. You’ll find this chili is great when you pair it with pasta and cheeses to complement the flavor, such as Parmesan, Gouda or Cheddar. The consistency of the Skyline chili is not thick, making it more of a sauce than your regular chili. It also works great as a dip for your tortilla chips, poured over hot dogs, and has a uniquely distinct taste. Also, the Skyline chili is great as a dip with tortilla chips when you have some friends over but don’t have the time to prepare something special. Should you run out of your favorite canned chili, this can be an alternative for your meal accompaniment. Interestingly, officials say that the unique recipe for the Skyline Chili, which is named after the Cincinnati skyline that could be seen from the original restaurant, is a well-kept family secret among the Greek Lambrinides’ surviving children, and the recipe is kept in a bank vault. Nutritionally, Skyline chili delivers 170mg of sodium, 4 grams of protein, 3% of Vitamin A, 2% of Vitamin C, 1% of Calcium and 3% of Iron. Lower in risk owing to its low sodium levels, it is also relatively low in its nutritional value. It is quite greasy, so cannot be eaten on its own. 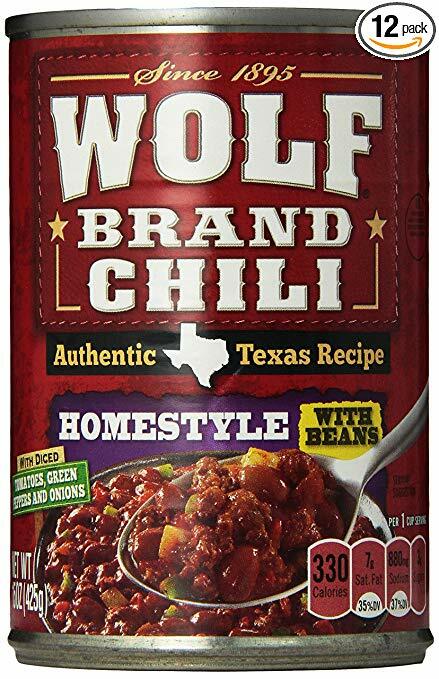 As chili as they come, Wolf Brand Chili is Texan in origin and taste. This chili has a hearty, bold flavor that is authentic in taste owing to the combination of beef cubes or turkey, regular beans and a half cup of vegetables- green peppers, onions, and tomato chunks. It is also available without beans, and with varying degrees of chili- Original, Mild, Hot and Spicy, giving you the option to suit your preferred taste. This filling Wolf Brand Chili has been around for a very long time, and has an almost home- made taste. It is packed with 25% Vitamin A, 6% Vitamin C, and also has 20 % Magnesium and 8% Calcium in it. A standard serving includes 17 grams of protein, and 880mg of Sodium which is tolerable as it helps deliver that distinct meaty flavor. Enjoy your Wolf Brand Chili which pairs well with hot dogs, hamburgers, French fries- or potatoes in any form, as well as over rice and pasta meals. Don’t forget the cheese and onion toppings! 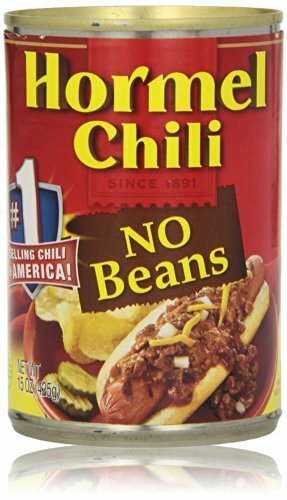 Hormel Micro chili is best known for its jalapeno pepper which gives it a unique, delicious taste. And can chili really be authentic without jalapeno? It also contains beef, beans, concentrated crushed tomatoes, and onions. It also contains pork, despite the description not indicating the same. Hormel Micro chili comes in versatile, easy to use containers that have been designed to allow you extract your chili and eat it fast! The container is small, so you can eat this chili directly without having to empty the contents into another dish. This chili is a good source of protein, with 22% (13gms) of the serving amount, It does however contain quite a substantial amount of Sodium, around 32% (770mg). This does not reflect in the chili’s taste, as it is mildly salty and spicy. Hormel Micro chili is packaged in a one small meal sizing, and pairs well with cheese and onion toppings, crackers and baked potatoes for hearty snacks. Well, this is not a canned chilli but I chose to put it here because it is my favorite chili for my stews. Manufactured in Chugwater, Wyoming, Chugwater Chili begun as a top secret recipe. Now, Chugwater Gourmet Chili Blend is packaged as a convenient chili powder that can be used for far more than just seasoning your Chili. This award-winning gourmet blend is the ideal complement to your recipes, with just tablespoons of Chugwater Chili Gourmet Chili Blend added to your natural ingredients, to make your perfectly seasoned chili. Whether you are making a meaty or vegetarian chili, this Chili Blend is not too spicy and not too sweet, It is also great for seasoning over your steaks, hot dogs, French fries, hamburgers and tacos. 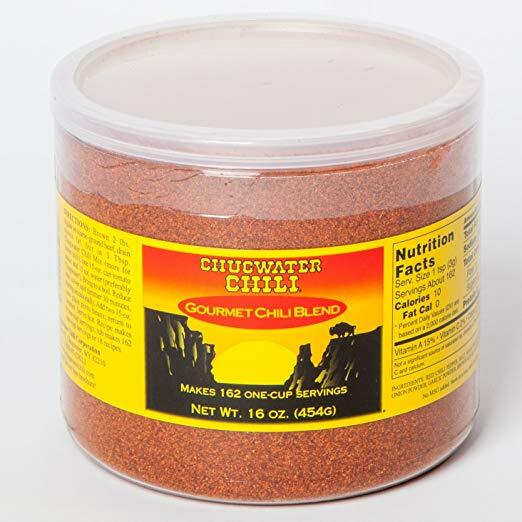 To try out their recommended recipes, visit www.chugwaterchili.com/products/chugwater-chili. Chugwater Chili Gourmet Chili Blend made with all natural ingredients, and contains no MSG or preservatives, and is gluten free. Beginning in 1915, May Belle Dennison developed a special method for capturing all the flavors of home cooking in a can. 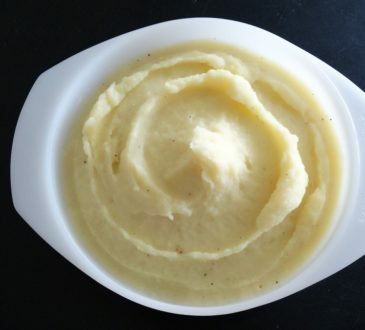 Originally prepared only for family and friends, this culinary delight quickly became popular. 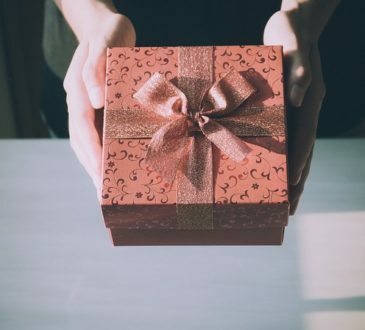 Local retailers begun receiving requests for her products and before long, her home kitchen was too small to meet the growing demand for her popular chili…. 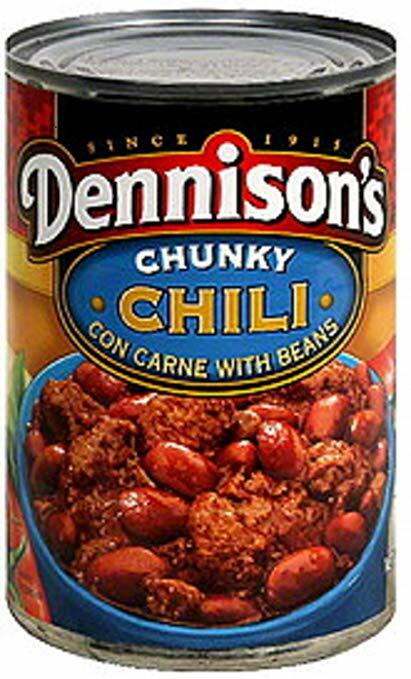 The popular Dennison’s Chunky Chili really is chunky, and filling with just the right amount of spice and flavoring, this chili is loaded up with soft pinto beans, plenty of prime beef chunks, and vine-ripened tomatoes in their own puree. It also contains soy flour and cornmeal, and is naturally made without any preservatives- or gluten, which makes it a healthy, hearty, satisfying meal for you. For those with soy allergies, the vegetarian option would be best. Your nachos, baked or fried potatoes, fritos, crackers and hotdogs will pair well with Dennison’s Chunky Chili, or have it alone topped with your favorite cheese. For all its spice, flavor and thickness, you can have it without an accompaniment. This chili is highly nutritious with the beef and beans giving you 20g Protein, 20% Vitamin A and 2% Vitamin C. You will not lack you Calcium and Iron either, at 6% and 20%, respectively. Quite filling, can be had as a meal on its own. There is a lot of controversy surrounding canned food specifically the health perspective. Chili is a favorite dish for many, but making it from scratch can be quite tedious that’s where a canned option comes in. Compared to fast food canned chili is a healthier alternative. You can substitute your fast food to a chili that is natural, spicy and tasty. The label at the back of the can provides you with precise information on the nutritional value of the canned chili you opt to purchase. The healthier option of a canned chili will provide you with Vitamins A, Vitamin C, Magnesium, Calcium, and Protein. It is also important to note the shelf life of the canned chili; it should be in BPA free packaging that is airtight to preserve its freshness. The sodium content in the chili should be a point of concern. A canned chili is should have low sodium content, within the recommended levels. If it fits within the recommended sodium levels it qualifies as a healthier option. Is wolf brand chili gluten free? Gluten sensitivity is an important factor when you pick your chili. Getting accurate information about the chili you choose to consume will help you plan your meals better. As you take your pick on any chili brand looking through the label keenly will ensure that you do not miss anything in their ingredient list. The wolf brand chili is listed as gluten free. It is one of the best tasting chili brands. It contains beef products and a unique combination of seasonings. You get one serving per container which has 400 calories. It is rich in protein and other essential nutrients such as calcium, iron, potassium and vitamin D. It is a delicious canned chili that is infused with authentic natural flavors. Is hormel vegetarian chili gluten free? No! Hormel vegetarian chili brand contains gluten. It is an alternative to the regular chili. This vegetarian chili is a good source of proteins; you get approximately 11 grams of protein per serving. The chili has just the right amount of spices. Hormel vegetarian chili brand contains beans in it and it is 99% fat free. This product has bold flavors with the perfect amount of seasoning. Being natural, it is made with no artificial ingredients, is minimally processed, and has no preservatives added. It is a good source natural source of iron as well as vitamin A. You get 190 calories per serving when you consume Hormel vegetarian chili. Does Hormel vegetarian chili have meat in it? Being a vegetarian is hard especially when you are looking for a new product to indulge in. Getting the right chili that caters to your culinary needs is essential because you need to be certain about the ingredients in the product. The hormel vegetarian chili does not have meat in it. This chili brand is 100% vegetarian. It instead contains beans which is a great source of protein and it is 99% fat free. The ingredient list in the hormel vegetarian chili also checks out for your vegetarian necessities especially the fact that it has no artificial ingredients. It is an all-natural product because it contains no preservatives. One serving of this chili gives you 10 grams of fiber and 11 grams of protein for only 190 calories. It is a natural source of iron as well as vitamin A. We do agree that the best chili is homemade, having sat on the fire, simmering for hours. However, canned chili is the best option for saving you time, and satisfying your chili cravings. When you have to prepare a delicious meal for your surprise guests, well, worry no more. With a wide variety in nutrition options, fillings and flavors, you can now easily select your preference with the tips we have shared above. Whatever your taste buds desire, you can now shop, pop out your can opener, and get chilin’. Glad to see Amy’s is #1. It’s my fave. I know right! It is my Favorite one too.